I want to take a minute to introduce my students, since they are the reason I am homeschooling in the first place and will be referring to them frequently. Most bloggers and commenters use pseudonyms to reference their children in an effort to provide some protection in this era of information. So in like fashion, I will refer to my students by pen names. My oldest child loves exploring, dinosaurs, legos, video games, and, most of all, science and animals. He wants to be a zoologist when he grows up! When we go on our Sunday adventure hikes, he likes being the leader, looking for new and interesting biology, and sharing and learning new facts. He is 6 and starting first grade this fall. I know it is kinda long for a pen name, but it really fits her to a tee. She is such an energetic and fearless adventurer. She loves everything girly but also loves playing super heroes with her brother. She absolutely loved the storybook Princess Super Kitty, and I did, too, because it says she can be anything and everything she wants to be — even everything all at once. She will be turning 4 this fall and starting Pre-K.
My name is Jennifer, and I am the author of Dear Homeschooler. I worked in a public school as a Special Education teacher in a specialized program for students with autism. 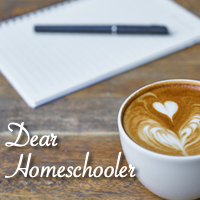 I have been homeschooling our own children for the past two years and have been loving every moment. I love traveling and reading. Read more about me here. My husband Mark is an MBA graduate and all-around tech guru. He loves biking, horses, and being with his family. That’s me and my family.